"Cut The Rope" and "Pudding Monsters": "Cut The Rope HD" ver. 1.8 adds Mini-game "Candy Feast"
"Cut The Rope HD" ver. 1.8 adds Mini-game "Candy Feast"
( Updated on 3rd November 2012: There're some other games related to "Cut The Rope", read: "Cut The Rope" Related Games. Amazon.com sells the "Cut The Rope Apptivity Game" and it has an interesting Demo Video showing you how to play the "Candy Feast" mini-game with the special "Apptivity" toy by Mattel. This "Candy Feast" mini-game is actually meant for kids. The video mentioned above is a Flash video and the iOS devices (iPhone, iPod Touch and iPad) have problems viewing Flash videos. If you have problems viewing it, visit Mattel's website instead: http://www.mattelapptivity.com/app-toys-games/cut-the-rope/. I think Amazon.com got that video from Mattel actually and this is the direct webpage link to that video at Mattel's website: http://www.mattelapptivity.com/app-toys-games/cut-the-rope/video.html. 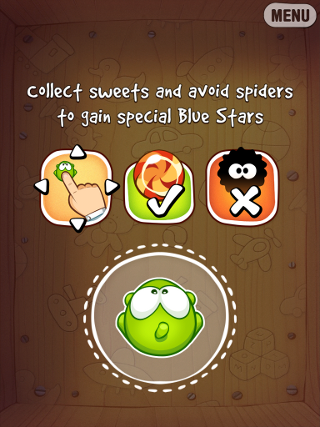 There's a new mini-game called "Candy Feast" in "Cut The Rope HD" ver. 1.8 and surprisingly, there's no mention of it in both the Apple iTunes App Store's description for the app and the official Facebook page of "Cut The Rope" (Update: ZeptoLab just mentioned it on 27th August 2012) . It was "Gregor Fran" who reported this to me as I don't play the "HD" (iPad) ver. and he provided the description and screenshots. 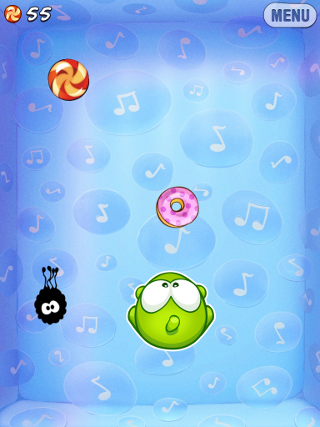 In this game, basically you move Om Nom around with the toy (or your finger) collecting candies, donuts and cupcakes. You have to avoid the spiders, otherwise it’s game over. If you let a sweet of any kind fall off the screen, it’s game over also. There's a magnet power-up that attracts the sweets to Om Nom, this will not attract the spiders. The background of the game seems randomized (sometimes it’s "Buzz Box", or "DJ Box", or any other box). You'll be rewarded with a "blue" star (normal stars are "yellow") whenever you collect a certain no. of sweets and this is added to your total no. of stars. There're also some new achievements associated with this mini-game. 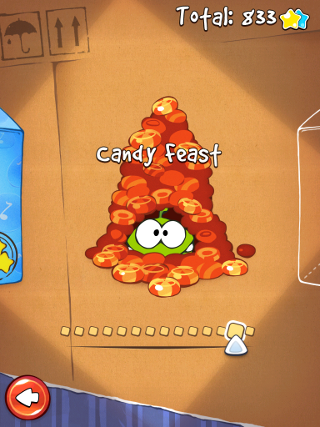 If you have the "Apptivity" toy, you can play this "Candy Feast" mini-game immediately with it but if you don't want to buy the toy and you still want to play it in "Cut The Rope HD", you have to "unlock" the game by getting 3 stars in all the levels and collecting all the "Om Nom drawings".